It is no secret that Niagara Falls has a long history as a major site of hydroelectric production and related industrial developments. What is perhaps less well known is that the famous cataract has been engineered to that point that it could be considered a simulacrum of the waterfall that was protected by the 1885 creation of the Niagara Reservation. Put differently, in the twentieth century Niagara Falls was transformed into a hybrid envirotechnical system that blends the organic and mechanical, turning the iconic waterfall into infrastructure designed to create both power and beauty. Fig. 1. Crest of Horseshoe Falls viewed from Goat Island in 2014. By the 1920s, the many hydropower stations along the Niagara Gorge were cumulatively breaking international legal limits on the amount of water that could be diverted from the Niagara River. In response, transnational engineering bodies indicated that the best way to preserve the falls was to reduce natural erosion caused by the water flowing over the precipice; industrial interests thus framed hydropower diversions as protecting the waterfall. The Special International Niagara Board, a joint initiative of the US and Canadian governments, was tasked with figuring out how to make these diversions practical while enhancing the aesthetic appeal of the waterfall for the tourist industry. The board’s ensuing recommendations were the basis for a US-Canada agreement inked in 1929: the Niagara Convention and Protocol. However, this convention couldn’t make it through the US Senate. The Special International Niagara Board continued its studies. In a 1931 report, the board analyzed every aspect of Niagara’s appearance: did the waterfall’s genius loci stem from its height, width, volume, color, or lines and angles? Color became a focus of concern in the report. According to the 1931 report, “the deep green appearance of the Horseshoe Fall” was “such an important feature of the great cataract.” But how to evaluate and change the color? The American physicist A. B. Clark invented a “telecolorimeter” to test for the desired “greenish-blue” shade of water, which was preferable to the whitish color that would result from an overly deficient flow. 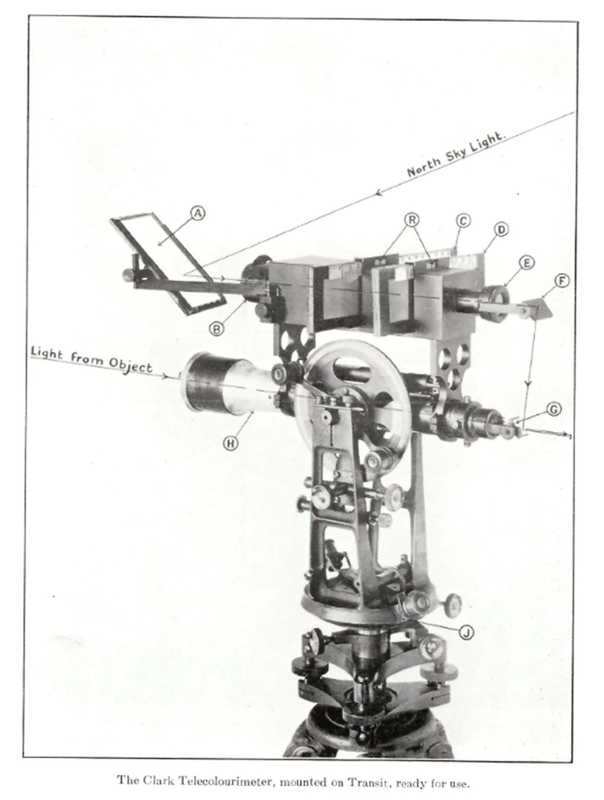 The telecolorimeter resembled a surveying instrument: it was mounted on a portable tripod, and the operator took readings of various points along the waterfall by looking through the device (see figures 2 and 3). © International Joint Commission (IJC). Courtesy of Library and Archives Canada (LAC). Map by Arthur B. Clark, 1927. As a result of telecolorimeter studies, quantitative and physical methods were used to determine qualitative values: e.g., the engineers determined that “[t]he optimum stream velocity to insure maximum persistence of the color curtain for the conservation minimum depth of 5 feet would be no greater than 15 feet per second.” This meant that the water would have the “correct” color when water depth and volume hit those minimums. Engineers also looked into ways of controlling the excessive mist and spray, since visitors complained about getting wet. At the same time, the denuded bare rock and jagged lines at the edges of the waterfall were a major detraction from the visual appeal. The primary goal was to, in the words of the transnational board, give the “impression of volume” and an unbroken crestline. Remedial works—such as submerged weirs and dams, along with excavations and fills along the lip—were recommended to produce the desired aquatic curtain with the requisite flow volume and color. Fig. 4. 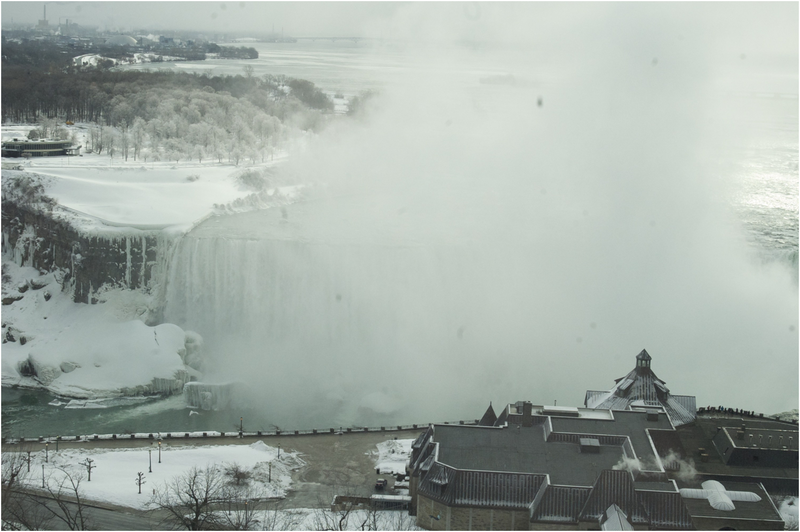 Mist and spray at Niagara Falls in winter 2013. Fig. 5. Changes made to the Horseshoe Falls in the 1950s. The 1931 report, along with the 1929 treaty, would serve as the conceptual basis for attempts in subsequent decades to engineer Niagara Falls. 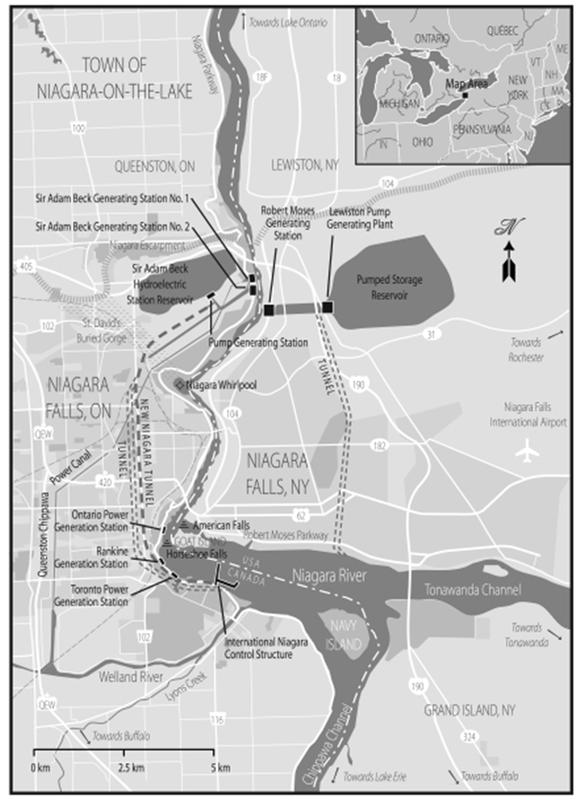 Finally, in 1950, the US-Canada Niagara River Diversion Treaty was signed, allowing the diversion of one-half to three-quarters—depending on time of day and season—of the river’s flow above the falls into enormous tunnels leading to the gigantic new hydropower developments downstream. Map by Rajiv Rawat, Anders Sandberg, and Daniel Macfarlane. © 2018 Rajiv Rawat, Anders Sandberg, and Daniel Macfarlane. 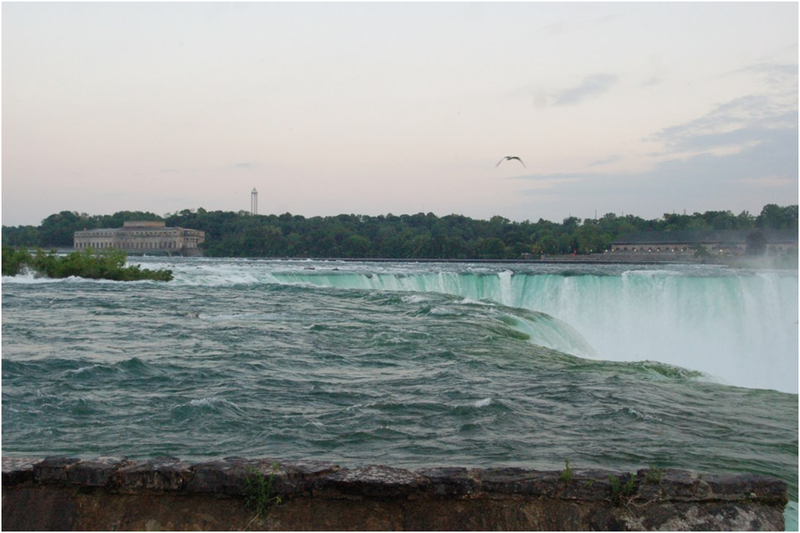 To visually hide the impact of taking the majority of Niagara’s water, the United States and Canada decided that the lesser volume could be disguised by shrinking and changing the Horseshoe Falls. 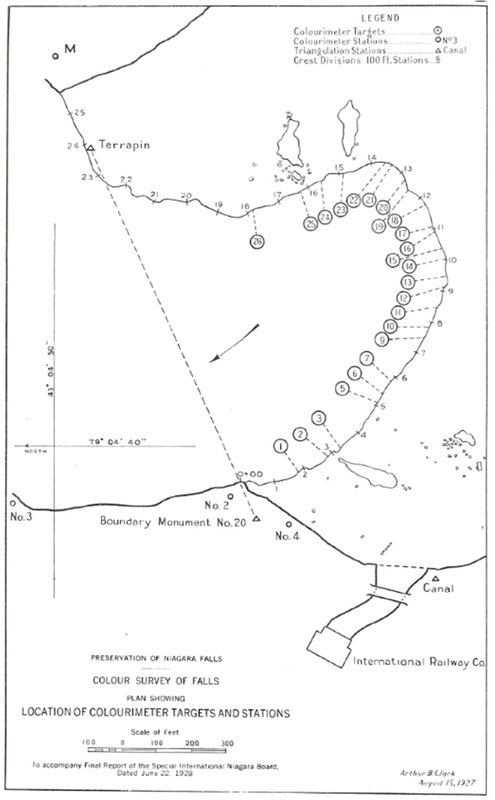 They cooperatively reduced its crest by 355 feet (see green area marked “Fill” in figure 5). 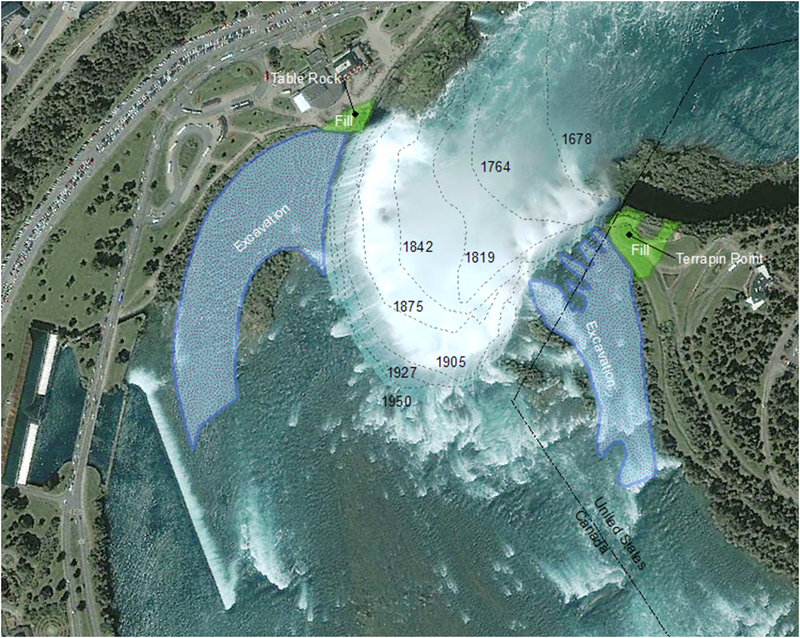 In addition, the two countries installed other remedial works, including a control dam in rapids above the waterfall and fills at the flanks of the Horseshoe Falls, and excavated 100,000 cubic yards of rock from the riverbed and lip of the waterfall (see blue area marked “Excavation” in figure 5) to turn the V-notch into more of a U-shape. The physical waterscape of Niagara Falls is therefore the product of the dual desire to produce energy and to retain its visual appeal for tourists. The Niagara telecolorimeter represents this tension between power and beauty. The telecolorimeter also entrenched the practice of scientifically measuring subjective aesthetics, including the notion that engineering an appropriate water color could distract from massive water diversions. This made the Niagara telecolorimeter central to the studies that eventually led to the 1950s transnational remaking of a North American landmark. Macfarlane, Daniel. “The Niagara Telecolorimeter.” Environment & Society Portal, Arcadia (Autumn 2018), no. 28. Rachel Carson Center for Environment and Society. doi.org/10.5282/rcc/8492. Irwin, William. The New Niagara: Tourism, Technology, and the Landscape of Niagara Falls. University Park: Pennsylvania State University Press, 1996. Macfarlane, Daniel. “‘A Completely Man-Made and Artificial Cataract’: The Transnational Manipulation of Niagara Falls.” Environmental History 18, no. 4 (October 2013): 759–84. Macfarlane, Daniel. “Creating a Cataract: The Transnational Manipulation of Niagara Falls to the 1950s.” In Urban Explorations: Environmental Histories of the Toronto Region, edited by Colin Coates, Stephen Bocking, Ken Cruikshank, and Anders Sandberg, 251–67. Hamilton, ON: L. R. Wilson Institute for Canadian Studies-McMaster University, 2013. Macfarlane, Daniel. “Dam the Consequences: Hydropolitics, Nationalism, and the Niagara-St. Lawrence Projects.” In Border Flows: A Century of the Canadian-American Water Relationship, edited by Lynne Heasley and Daniel Macfarlane, 123–50. Calgary: NiCHE-University of Calgary Press Environmental History Series, 2016. McGreevy, Patrick. Imagining Niagara: The Meaning and Making of Niagara Falls. Amherst: University of Massachusetts Press, 1994. Strand, Ginger. Inventing Niagara: Beauty, Power, and Lies. Toronto: Simon & Schuster, 2008. Daniel Macfarlane is an Assistant Professor at the Institute of the Environment and Sustainability at Western Michigan University. He is the author of Negotiating a River: Canada, the US, and the Creation of St. Lawrence Seaway (2014) and co-editor of Border Flows: A Century of the Canadian-American Relationship (2016). He is currently finishing a book manuscript on the modern history of engineering Niagara Falls for hydro-electricity and beauty.